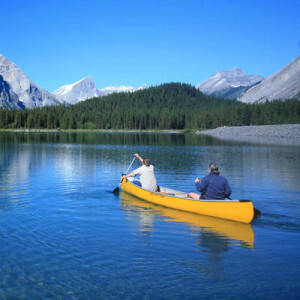 Canoeing is a traditional form of Canadian transportation that is a great way to explore the waterways of the mountains that are otherwise inaccessible–places such as Vermilion Lakes in Banff National Park, where beavers, elk, and a great variety of birds can be appreciated from water level. Canoes can be rented on the Bow River in the town of Banff, Lake Louise, and Moraine Lake in Banff National Park; Pyramid and Maligne Lakes in Jasper National Park; Cameron Lake in Waterton Lakes National Park; and Emerald Lake in Yoho National Park. Expect to pay around $20 to 45 per hour. The more adventurous visitor can rent a canoe and paddle down the Bow River from Lake Louise to downtown Banff. Anywhere you can canoe is prime for stand-up paddle boarding (SUP), which has gained popularity throughout the mountain parks. While the lakes of the Columbia Valley provide the warmest water, places like Moraine Lake provide a unique paddleboarding experience. The rafting season is relatively short, but the thrill of careening down a river laced with rapids is not easily forgotten. Qualified guides operate on many rivers flowing out of the mountains. The Kicking Horse River, which flows through Yoho National Park to Golden, is run by companies based in Golden, Lake Louise, and Banff. This is the most popular river for rafting trips. The Sunwapta River in Jasper National Park and the upper reaches of the Fraser River through Mount Robson Provincial Park are others offering big thrills. For a more sedate river trip, try the Bow River in Banff National Park or the Athabasca River in Jasper National Park. Both are run commercially. All companies offer half- and full-day trips, including transportation, wet suits, and often light snacks.